It’s perhaps something of an understatement to say it’s not been the greatest couple of weeks for English sides in Europe. None of the four sides from the ‘the best (richest) league in the world’ managed to secure a valuable first leg victory in their Champions League last 16 matches. But in the spirit of fairness we’ve judged each of Manchester City, Arsenal, Manchester United and Chelsea on their merits and the difficulties their respective opponents have posed. 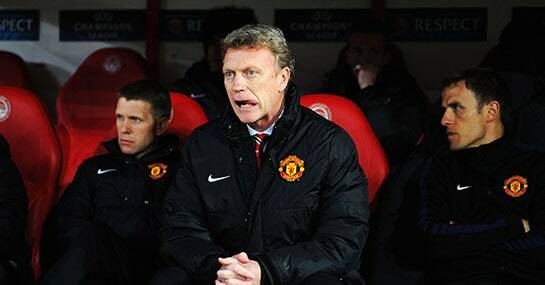 In that regard Manchester United manager David Moyes may want to look away now. Here’s our news team’s half-term report of how things stand after the first legs of their respective Champions League ties. Devoid of any attacking threat and given a rude awakening in their first foray into the Champions League knockout stage, Manchester City were outfoxed by a Barcelona side who many were prepared to consign to football’s scrapheap. Instead, the Catalans displayed all of the artistry that’s ensured their current crop will forever be remembered among the pantheon of greats. City now face the almost insurmountable task of overturning their first leg deficit at the Nou Camp, a mission that even with the returning Sergio Aguero they’re likely to find impossible. The Sky Blues’ performance laid bare the areas where they need to improve in order to compete with their elite counterparts. Defensively vulnerable (we’re looking at you Michel Demichelis) and largely impotent in attack, City are still far from the finished article in Europe and they flattered to deceive. Like City, Arsenal had to play with 10-men for much of their first leg, however before Mesut Ozil’s penalty miss and Wojciech Szczesny’s sending-off they at least looked like laying down a challenge on behalf of the Premier League. And although Bayern rode the early storm in north London and fought back to grab a two-goal lead that should see them over the line, Arsene Wenger’s Gunners are perhaps deserving of more credit than Manuel Pellegrini’s men. Bayern boss Pep Guardiola has fine-tuned the team that lifted the trophy last term, adding an even greater intensity, and it was the Bavarians’ relentless probing that eventually broke Arsenal hearts and culminated in Thomas Muller’s potentially decisive second goal. Against such opposition, Arsenal were not disgraced though and if they can rekindle the spirit that saw them grab a 2-0 victory in Munich last season there may still be hope for them yet. If reports are to believed, Manchester United manager David Moyes has 12 games to prove to the board that he has what it takes to re-build an increasingly bereft side. And on the evidence of this showing the former Everton supremo will need a minor miracle to bring about a drastic change in fortunes. Pulling Olympiakos out of the hat appeared to represent a plum draw for the Red Devils but instead it was the three-time European Cup winners who were made to look ordinary. Robin van Persie’s wasted attempt to salvage something from their first-leg disaster summed up an evening where the United’s squad’s fragile mindset began to unravel further. Chelsea at least managed to do what none of their Premier League counterparts managed – score a goal – but even Jose Mourinho’s side will be feeling somewhat deflated after their trip to Istanbul. An inability to kill off the game following Fernando Torres’ opener meant Galatasaray were able to mount a comeback, with the Spaniard himself guilty of wasting a gilt-edged chance to increase the Blues’ lead. Instead, Aurélien Chedjou’s equaliser set-up an intriguing return leg at Stamford Bridge, a match where Chelsea will have to supplement their defensive doggedness with killer instinct if they’re to progress comfortably.